People just looove to talk about the newest royal couple, and even this Houston podiatrist can’t help but get in on the action! A few weeks ago I wrote about Meghan Markle’s trick of wearing high heels that are a size too large so that her sore feet have room to swell in peace. Clearly, I also explained why that was a bad idea. Well, this week, I’ve got a different royal foot to focus on: Prince Harry’s! The dapper red-headed prince was spotted out at a pal’s wedding wearing shoes that had a hole in one of the soles! After carefully researching (gossipy websites) I also learned that this is not the first time he’s worn said shoes: the red-headed ruler also wore them at an April memorial ceremony in London. Now, technically speaking, there’s nothing wrong (per se) with having a hole in the bottom of your shoe as long as your feet aren’t left exposed, but it still isn’t an ideal situation. After all, the soles of the shoe provide support to your feet, which in turn bear the weight of your entire body, so it stands to reason that you should keep the pairs you wear the most in good working order…especially if you’re British royalty, and can afford a trip to a decent shoe maker! 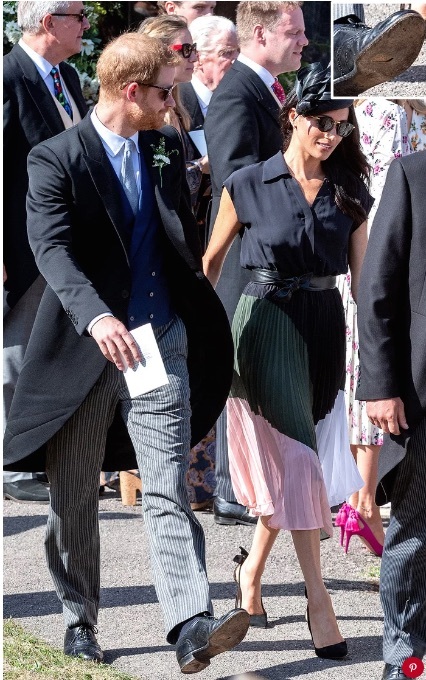 So, crown’s off to Harry for being down-to-earth enough to keep on wearing the same old shoes, but consider this post my suggestion to care for the soles of your shoes if you wish to keep your feet reigning comfortable for years to come!